Romney Adviser: Everybody Loves Donald Trump! Right? You hear that? He’s on television. They don’t just go putting maniacs on television because they stir up attention or anything. Television executives are going to make sure a majority of voters approve of you and your political ideas before they let you on the air. For what it’s worth, a 2011 poll found that 65 percent of Americans would never even consider voting for Trump. (The comparable figure for Romney was 45 percent.) Another 2011 poll, which found Obama beating Ronney by six points in a head-to-head matchup, had him walloping Trump by 28 percentage points. A more recent poll found that Trump is two percentage points more popular than Congress, which sounds kind of encouraging, except that the same poll found that “cockroaches” are also two percentage points more popular than Congress, and Genghis Khan is a whopping four percentage points more popular than Congress. A Trump–Genghis Khan general election race would have been close and exciting. 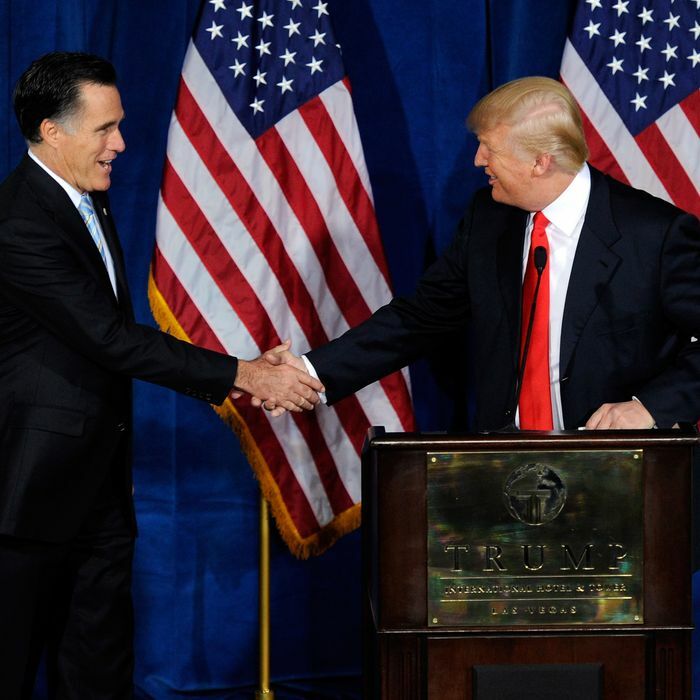 Romney Adviser: Everybody Loves Donald Trump!